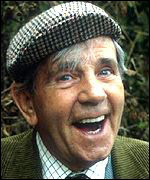 The dominant clown of British post-war cinema, Norman Wisdom brought his comic character, the Gump, developed through stage and television, to the cinema with immediate success in Trouble in Store (d. John Paddy Carstairs, 1953) for which he won a BAFTA as Most Promising Newcomer. His little man against the world was portrayed with robust, physical slapstick in a series of films produced by the Rank Organisation peaking commercially with A Stitch in Time (d. Robert Asher, 1963). He made two films independently in order to extend his range, one of which, There Was a Crooked Man (d. Stuart Burge, 1960) is amongst his finest, but the cinema public craved only the Gump. Wisdom 's popularity extended well beyond Britain - reaching the Iron Curtain countries and Iran. However, it was his musical-comedy debut on Broadway that bought him to the attention of Hollywood where he made The Night They Raided Minsky's (US, d. William Friedkin, 1968). In 1981 Wisdom made Going Gently (BBC, d. Stephen Frears) for television, a non-comic role as a dying cancer patient. Autobiography: Don't Laugh At Me (1992). Biography: Trouble in Store by Richard Dacre (1991). Comedy in which Norman Wisdom foils a robbery in a department store.